Brush a baking pan with olive oil and rub with garlic. Set aside. For the garlic-flavored butter: Finely mince the garlic. Place the garlic, the no-salt seasoning (see tips), 1 teaspoon of table salt and white pepper in a mortar and pestle. Blend the garlic into a thick paste and mix with the creamy, softened butter. Par-boiling the potatoes (see tips): Wash the potatoes (no need to peel). Place them in a large pot. Fill it with cold water until the potatoes are barely covered. It's important to start with cold water so the potatoes cook evenly. Bring to a boil, add 1 teaspoon of salt and reduce the heat to medium-high (if you cook the potatoes at a roaring boil, they might fall apart). Cook for about 5-6 minutes. The potatoes should still be firm. Drain the potatoes thoroughly and let them cool a little. Cut the potatoes in half if some are bigger than the others. 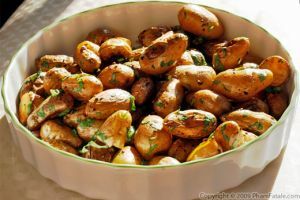 Once the potatoes are cool enough to handle, cut a thin slice on one side to create a base, so the potatoes remain stable while roasting in the oven. Prepping the potatoes: Let the potato stand on its base and cut it into about 1/8-inch thick slices, making sure you don't cut all the way through the base so all the thin slices remain attached. 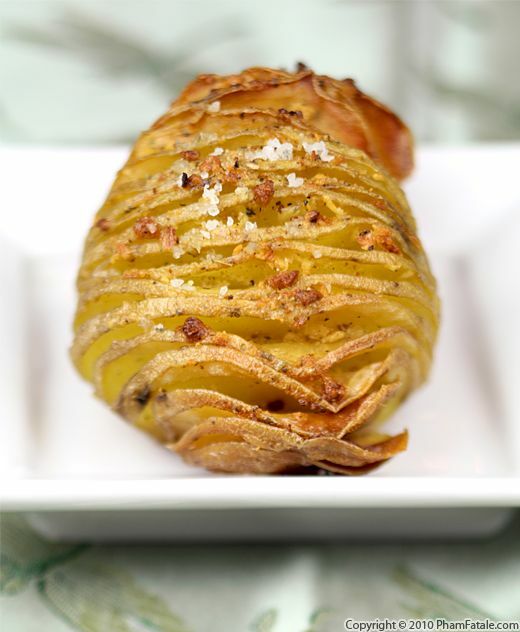 Create the thin packed layer of potatoes, opening them like a fan. Roasting the potatoes: Place the potatoes to the greased baking pan (for easy clean-up you could line it with oiled heavy-duty aluminum foil). 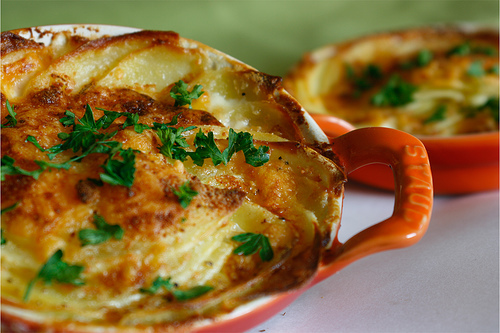 Bake for about 2 minutes and once the potatoes have completely dried, remove the pan from the oven. Using a butter knife, spread a thin layer of the garlic butter between each slice. Transfer back into the hot oven and roast for about 50 minutes at 425°F. Sprinkle with coarse sea salt. When there's a nice brown crust, your potatoes are ready! I used a store-bought organic no-salt seasoning from Costco. You could add any blend of seasoning to the butter, such as dried basil and garlic, paprika or even red chili powder.